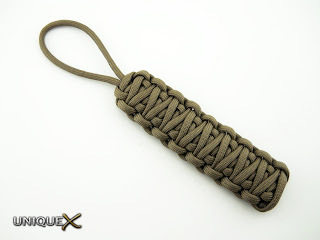 This is probably the most popular paracord knot on the internet. it's fun to tie and easy to learn. This is a beginner's guide to creating a Solomon Bar fob. I will be using this as a "beta test" to determine what type of guides you find useful. And hopefully I can gain a more broad audience. Download a copy of the original guide which was created in Adobe PDF to store on your hard drive by right-clicking on the link below and selecting "Save As..." and select a spot on your drive where you want it to be stored. Or you may simply click on the link to open in your browser (you must have a free copy of Adobe Reader installed on your computer). If you would rather not install Adobe Reader, I uploaded the PDF to Scribd, but the guide lost some of its image quality. For this tutorial, you will need 11 feet of paracord (or other cord), scissors, and a lighter. Click on each of the images below to view the larger size. You are awesome! ;) Thank you for sharing! Thanks for the great tutorial -- I'm going to try this out with my kids and then hopefully use it as a Beavers craft in the new year.